Currently, forty-eight U.S. states and 11 Canadian Providences have legislation, regulations or policies requiring drinking water system components to comply with, or be certified to, NSF/ANSI 61. Learn how NSF/ANSI 61 affects your projects, the 3 questions you should ask yourself when choosing an NSF/ANSI 61 gasket material for your application, and the EPDM material we recommend for hot water applications. Rubber gaskets utilized in drinking water systems must be free from chemicals that can leach into water supplies and lead to health issues or cause unpleasant tastes and odors. Plasticizers, antioxidants, solvents and other additives commonly used in rubber gaskets are designed to create desirable material properties, however, when they come in contact water treatment chemicals like chlorine, they can have a negative reaction. 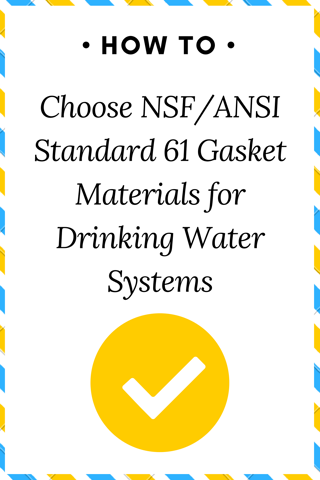 Choosing a gasket manufacturer that understands NSF/ANSI 61 requirements allows you to source the right materials and receive high-quality plumbing components that support your projects. In the United States, failure to meet the requirements of NSF / ANSI Standard 61 can result in steep fines or even legal action. Construction companies and general contractors that use non-compliant components could be required to remove and replace plumbing. Health Canada, Canada’s federal department dedicated to promoting Canadians’ well being and health, strongly encourages the use of drinking water components that meet standards from accredited organizations like the NSF. Is the application in a hot or cold environment? How frequently will you replace parts? Does this material need to support both hot water and cold water services?